I love the concept of this – sons of a con man having to live in the town where he pulled his cons. Sounds really interesting! love the sound of this book and that it will be a series! 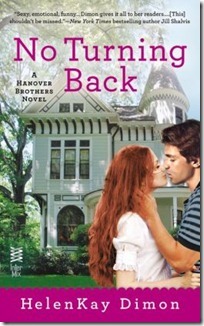 I’m so excited about the Hanover Brothers series. Congrats on the new release. No Turning Back sounds fantastic. Can’t wait to read it to see more of Declan and Leah. Thanks for that great excerpt and giveaway. Can sense the sparks between these two. Rule 2 about the touching is an odd rule for her to mention for a business meeting. This sounds great. Great excerpt, definitely hooks you! Excited it’s the first of at least three! Sounds really good to me! I can’t wait to read it! this sounds very original and awesome! Thanks for sharing!